STARRY RHYMES: now available for purchase! Apologies for the delay in posting these details — I know you’ve all been waiting with baited breath! STARRY RHYMES is finally available to purchase, right here, for the bargain price of £5 plus P&P! You probably know by now what STARRY RHYMES is all about — but if not, check out our submissions call to see what it was we were looking for! 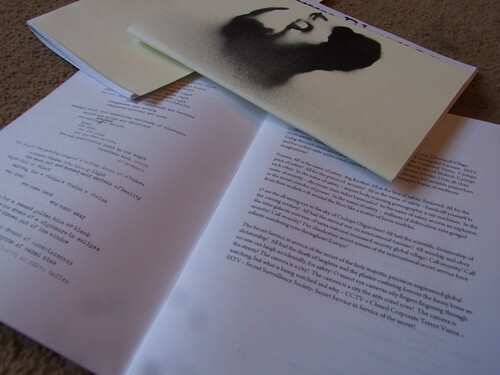 We received nearly 150 emails to register interest in the project, and over 130 poems were submitted. After much deliberation, we managed to whittle these down to just 33. You can find out a bit about the folk whose poems we picked here. Each copy of STARRY RHYMES is printed on high quality 80gsm white paper, and has a unique, handmade cream cardstock cover. No copy is quite the same as the others! Each was lovingly hand-cut and stapled to produce a limited single printing of 140. 33 of these went to our fabulous contributors, and we sold a huge pile of them on our rather raucous launch night (check out Chris Scott‘s amazing photos from the event here! )… so these books are disappearing fast! If you’d like a copy, they’re only a fiver plus P&P, and you can get your hands on one right here. Just click the Paypal button below and follow the instructions! No Paypal account required — if you’re not registered, just pay with your card as you would elsewhere online. 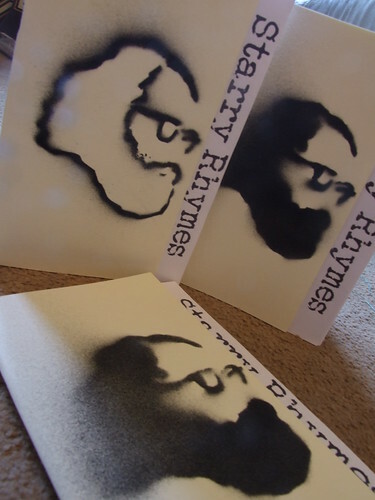 STARRY RHYMES is a product of Read This Press, a DIY micropress specialising in limited edition print runs of handmade poetry pamphlet anthologies and collections. RTP is run by poets/teachers/Edinburgh residents Claire Askew and Stephen Welsh. It is not unknown for us to be described as a “punk” press. We particularly like poets who are new/unknown/upcoming, intimidatingly well-read, and tattooed. You are currently browsing the One Night Stanzas blog archives for June, 2011.